. Published on July 17, 2015 . 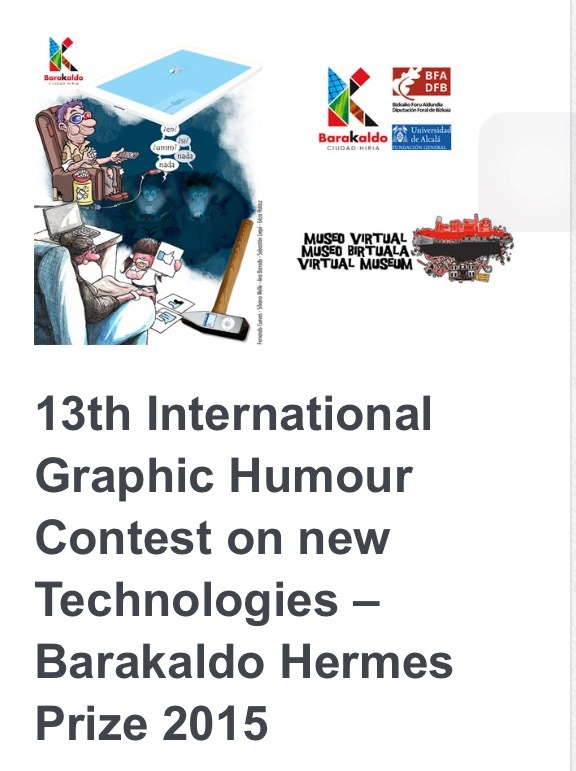 Sketchers called to send in a scene depicting graphic humour relating to new technologies which impacts on daily life (INTERNET, BIOLOGY, SPACE, TELECOMMUNICATIONS, MEDICINE, ETC…) and which allows the citizens to reflect on new spheres of scientific progress. It can also be vignettes depicting geek attitudes generated by users of social networks or taking part in Web 2.0. Scenes and characters must be the personal creation of the author and unpublished. Work can be submitted either in black and white or in colour. Works must not exceed a single page, with a format not exceeding 800 x 600 pixels per inch, with a minimum resolution 72dpi. Nonetheless it will be convenient to carry out the work initially on an A-3 or A4 format and 300dpi resolution, horizontally or vertically. The awarding of the Hermes de Barakaldo prize carries a financial reward amounting to 4.500 Euros and is divided into five categories: First Prize: 1.500 €, Second Prize: 1.000 €, Third Prize: 800 €, Fourth Prize: 700 € and Fifth Prize: 500 €.